i setup 2nd win7 as dual boot, setting up all the mobo drivers. one of the setup is the intel chip drivers from Asus. upon restart and login, there's always an error popup "Can't find AsusSetup.ini : C:windowschipsetdriverhotfixasusSetup.ini"
there's no such folder/file in that path. I would like to remove this, but can't find out which app triggered this using msconfig. no hint any app may caused this error. I try uninstall, but chipset installation has no uninstallation option. I already tried the latest update from their official download site, in fact that setup give me error about "does not support this operating system : WNT_6.1P_64_MCE"
see, I really have no confidence with their support. A Scheduled task which configured to activate during the start-up or booting could be the reason for this error "Can't find AsusSetup.ini : C:\windows\chipset\driver\hotfix\asusSetup.ini". Removing or disabling that task will solve the issue permanently . 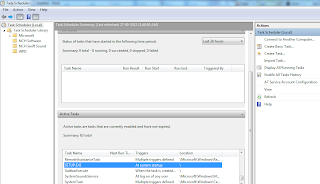 How to remove or disable a scheduled task. 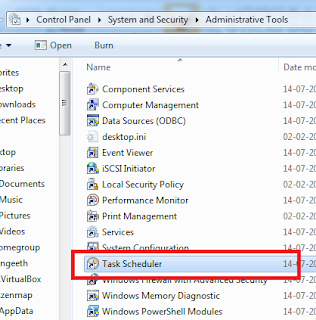 Go to "Control Panel\System and Security\Administrative Tools"
Select the "Task" located under "Active Tasks"
Then click the Delete button located in the right pane .